Darmstadt-born, Villalobos-basement-partied Roman Flügel plays comfortably at any wing of a disco, house or techno party for more than 20 years. His sound proves the thesis that not expensive instruments but creativity in compiling a sound spectrum determines the result irrespective of hardware price tags. EDHID spoke with Roman Flügel about weird hotel rooms, early influences like Sven Väth, legendary club Omen, his new album Happiness Is Happening on DIAL Records and why paying for music is a matter of respect. Hi Roman! You share occasionally some impressions from your travel on your social media. Which was the most weirdest hotel room so far? I think that it was a room in Barcelona long time ago. We were supposed to have a Klang Elektronik label night and the budget was probably tight. So the promoter put the four of us in a hostel that had rooms by the size of a prison cell and no windows. That’s exactly what you don’t want when you want to feel welcomed. In 1988, Sven Väth opened his legendary club Omen in Frankfurt that represented the entire zeitgeist of the city’s scene. How did you feel when you first entered Omen? In the very beginning it had a traffic light at the door. The bouncer would look at you through a small window and when the light turned green you could enter. If not, you had to leave. They finally changed that door policy and the place became the living room for everyone who was into the latest acid house or techno tracks. I had a great time there, especially in the first two or three years. What role did Sven Väth play during your musical career? He’s been very helpful and supportive for a long time. He plays my music until today but looking back you’ll find out that he released the first two Alter Ego albums and several 12”s on his Harthouse imprint (editor’s note: sublabel of Eye Q Records; Väth left the label in 1997). We produced several tracks together on two of his albums and he invites me regularly to play his Cocoon Ibiza parties at Amnesia since more than ten years. As a dedicated musician, when and why did you start DJing? I did my first mixtape together with a friend when I was 14. I recall that I was eager to get two Technics 1210 and a mixer around the same time. However, it took me another five years until I could afford to get at least one. I loved to DJ on NYE parties and remember playing “House Nation” by House Master Boyz (editor’s note: released on Dance Mania Records in 1986) on one of these from a cassette tape back in 1987. Soon after, acid house made massive waves and the amount of parties exploded immediately. I wanted to participated at this movement and share the music I like as a DJ. That’s how I got into it. The success of your collaboration together with Jörn Elling Wuttke under the moniker “Alter Ego” resulted in countless live performances worldwide. If you compare performing live and DJing, in which discipline can you express your musical vision better? You can’t really compare it. The only thing I can say is that it’s quite boring after a while when you play the same songs all over again every weekend even though they are your own songs. As a DJ you have to be interested in new music that’s what I like about it. Playing live can be great but you have to find a way to keep it interesting. Your music is characterised by a constant change. How important is will and courage to evolve for musical longevity? It’s true that I’ve made a lot of different music but I think I’ve created my own style, which is more important to me than keeping it “real” in one genre. Will and courage are important to stay with what you really want to do because most things don’t come easy. You have to work and even creativity has to be triggered by something. Which doesn’t happen without doing something. How did the Internet change the value proposition within the music industry from an artist perspective? I guess it has changed a lot. For me value of music itself hasn’t changed at all just because it’s accessible and free if you don’t want to pay for it. Value is something that is given by your own standards. This means that I still buy everything that I’m listening to just because I think it is worth it. Artists and labels deserve to get some share for what they are doing. It’s a matter of respect. Just the fact that something is accessible for nothing does not legitimize to take it. It’s everybody’s decision to just consume without thinking of the fact that it took some time and work to actually create something. It has never been easy to survive as an independent label or artist but I wouldn’t say that all the possibilities created by the Internet have changed things in a better direction. You second album Happiness is Happening was released at Dial Records on 01 September 2014. What inspired you to create something darker compared to its predecessor Fatty Folders? I don’t know really. It was al feeling from the beginning that I wanted to become a little rougher. The sweetness lies underneath layers of distortion. How did it feel to use/work with your own voice for the first time? It felt ok, I didn’t really sing though. I created some choir sounds and used them pretty much in the back or I alienated my voice completely that no one would realize it’s me. One of the defining features of the releases at DIAL is the artistic approach. Apart from all the travelling and production work, do you have enough time left to co-determine artist selection, theme and message of the artwork and video clips? DIAL is taking care of the artwork but I’m responsible for the videos. Peter and David (editor’s note: Peter Kersten and David Lieske) run the gallery “Mathew” in Berlin which means they are the experts if it comes to designing the sleeve. What inspires you? Could you imagine producing an album without thinking of any restrictions due to homogeneity requirements of a label? Sure, I can! I think the new album is pretty different to what many people would consider as a classic ”DIAL” album. You founded together with Ata Macias, Heiko Schäfer, Jörn Elling Wuttke Playhouse, Klang Elektronik and Ongaku. What would you recommend to young aspiring label founders in today’s music business environment. I hardly can recommend anything since I haven’t worked in the label business for the last five years or so. I’d say you better love what you do and being able to calculate definitely helps to survive. I’ll release a 12” on DIAL later this year. It will contain unreleased material and will be accompanied by a video created by Karl Kliem. 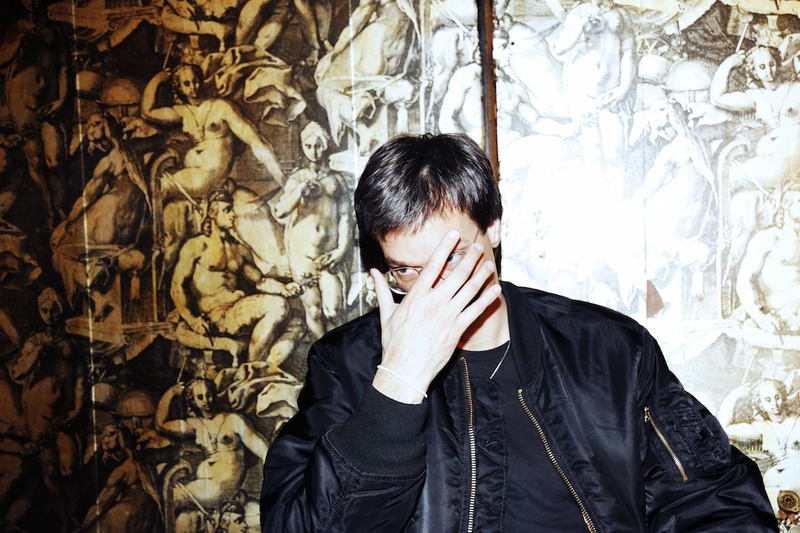 Roman Flügel’s Happiness is Happening is out through Dial Records.